In nature, little is wasted, not even puddles. At this time of year, nature’s puddles – officially known as “vernal pools” – are teeming with life. Vernal pools form in the winter, last through the spring and dry up in summer. Found throughout our woodlands in sizes large and small, they are hotbeds of early spring activity. Frogs and salamanders crawl out of the forest’s leaf litter and make their way to the water to frolic and mate. Soon the pool is full of eggs, then tadpoles and salamander larvae. To amphibians, the pool’s benefit is big: There are no fish to eat them or their offspring. The risk, however, is drought. The water must last long enough for the tads to reach adulthood. 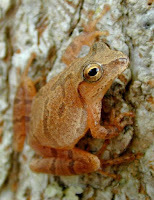 Clearly, the benefit outweighs the risk, for our woods still ring out each April with choruses of the popular vernal pool patron, Spring Peepers. A bigger threat, however, is man. Too few know what vernal pools are, much less their importance, and no laws protect them. Many are threatened by development. Dr. Seuss’s Lorax spoke for the trees. Fortunately, we have a few wise conservationists and savvy zoning commissioners who speak for the pools. I've never realized the significance of a simple puddle... how zen :) Thanks for sharing!